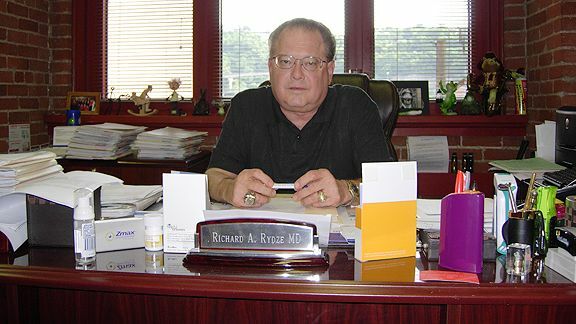 Long before he was accused of peddling steroids, Richard Rydze earned more than $400,000 a year as a prominent doctor who had worked for the Pittsburgh Steelers, the FBI and the Little Sisters of the Poor. A 185-count federal indictment filed last month appears to mark the end of Rydze’s personal and professional free fall, a collapse that records and interviews suggest involved years of credit card debts, a Vicodin addiction and a career that increasingly veered toward the illegal dispensing of human growth hormone. Rydze, 62, is accused of illegally selling growth hormone, steroids and pain killers over several years. Federal prosecutors from Cleveland who are handling the case say he doled out the steroids and growth hormone from September 2007 through March 2011. He left the Steelers, after about 22 years, in the summer of 2007, and he has vowed in published reports that he never gave the drug to a member of the team. The team has declined to comment on the allegations. But some who have left the organization said the charges against Rydze stunned them. Fuhrman’s wife was a patient of Rydze’s, and the coach said he never had any suspicions about Rydze giving drugs to players. Rydze’s attorney, Marketa Sims, did not return phone messages seeking comment. Rydze has pleaded not guilty to the charges. The indictment does not identify those who received the drugs from Rydze. But it makes clear Rydze’s motivation behind his dispensing them: He earned nearly $450,000 in commissions from a pharmacy that handled his prescriptions from August 2007 through January 2011. Those sales came at a time when his finances were crumbling, according to records filed in 2010 in U.S. Bankruptcy Court in Pittsburgh. He listed his liabilities at $1.25 million, an amount that included more than $100,000 in credit card debts. He listed his assets at $800,000. In federal court last month, federal prosecutor Carol Skutnik said Rydze had a problem that went beyond money: He was addicted to Vicodin. Few could have foreseen such a fall. Â In the late 1960s and 1970s, Rydze made his name in the water as a platform diver. He won the silver medal at the 1971 Pan American Games and at the 1972 Munich Olympics, according to the web site sports-reference.com. He graduated from the University of Michigan in 1971 and later attended the University of Pittsburgh School of Medicine, the web site reported. He went on to practice internal medicine. In the mid-1980s, he joined the Steelers, working mostly as a game day doctor who also performed physicals, according to interviews and published reports. He had a practice at University of Pittsburgh Medical Center and worked as a doctor for the Little Sisters of the Poor. An administrator for the religious order declined to discuss Rydze or his position. His practice also led him to handle the physicals of FBI agents in Pittsburgh, a task that forced agents and prosecutors in Cleveland to handle Rydze’ investigation to avoid a conflict of interest. In 2007, Rydze’s links to growth hormone surfaced in the investigation of Signature Pharmacy in Florida. He used a personal credit card to buy $150,000 of testosterone and growth hormone, according to the Times Union of Albany, N.Y., which had been reporting about the pharmacy’s links in the state of New York. Investigators discovered Rydze by studying invoices tossed in the pharmacy’s garbage and obtaining Federal Express records, the paper reported. He also was linked to medical purchases at the College Pharmacy in Colorado Springs, according to interviews and published reports. The owner, Thomas Bader, was indicted in 2007 on charges of importing and distributing growth hormone from China and distributing anabolic steroids. A jury convicted Bader, and he was sentenced to 40 months in prison in 2010. It is unclear why Rydze was never charged in either investigation. But months after the news broke about Rydze’s link to the Florida pharmacy, he parted ways with the Steelers and University of Pittsburgh Medical Center. Federal records show Rydze formed his own company, Optimal Health Center, in September 2007. In 2008, he earned $404,200 in salary, according to federal records. The next year, he took in $266,800, the records show. In a 2009 story, ESPN.com discussed Rydze leaving the Steelers and the University of Pittsburgh Medical Center and going out on his own. He appeared to lack any regrets. “I have a huge practice, and I can make better money doing it this way,” he told the web site. A year later, in 2010, Rydze and his wife filed for bankruptcy. The debts included tens of thousands of dollars on back taxes to the Internal Revenue Service and credit card companies. Bankruptcy records show more than Rydze’s financial struggles. They also foreshadowed a link to the charges federal prosecutors would file against him. In April 2010, Rydze deposited $9,000 from a business called ANEWrx, a pharmacy in Pittsburgh. Federal charges say ANEWrx developed business relationships with a number of doctors who promoted steroids, growth hormone and other drugs. Years earlier, Rydze met with William Sadowski, the president and co-owner of ANEWrx. They agreed that Rydze would be paid a commission for every prescription of growth hormone and anabolic steroids that his patients filled at the pharmacy, according to the federal charges. Rydze and Sadowski agreed to mark up the prices to Rydze’s patients, and Sadowski would kick back the additional funds to Rydze, the charges said. From August 2007 to January 2011, ANEWrx paid Rydze and his business nearly $450,000, according to the charges. Sadowski and a nurse who worked for him, John Gavin, pleaded guilty to federal steroid charges earlier this month in a criminal information, a sign that they could be cooperating with federal prosecutors in the investigation. In March 2011, federal agents from Cleveland searched Rydze’s office looking for evidence linked to his prescribing of drugs. More than a year later, in July, the DEA suspended Rydze from prescribing medication. The agency said Rydze prescribed drugs “for other than legitimate medical purposes.” It also said he used another doctor’s DEA registration to prescribe medicine. Despite the federal agency’s order, he continued to write prescriptions weeks later, according to court records. In October, federal agents arrested Rydze on the 185-count indictment which says he illegally dispensed painkillers, growth hormone and steroids. Besides the charges involving steroids, Rydze is accused of obtaining more than 21,000 Vicodin ES pills from February 2005 through October 2011 by calling in more than 200 prescriptions to Pittsburgh-area pharmacies. He did it by obtaining a DEA registration number that belonged to another doctor who did not give Rydze consent. The charges also say Rydze committed health care fraud by diagnosing more than 90 patients with pituitary dwarfism, a condition in which patients do not reach 5 feet tall in height. Growth hormone and other drugs often are prescribed to those patients to promote growth. But the indictment says all of Rydze’s patients stood more than 5 feet tall. One patient diagnosed with the pituitary dwarfism was a 61-year-old former karate competitor and body builder who had no physical characteristics consistent with dwarfism, according to the charges. The indictment also accused Rydze of trying to hinder the investigation by attempting to persuade two witnesses to provide false testimony. He also made false entries in the charts of two patients, according to the charges. In court, federal prosecutors urged to keep Rydze behind bars. They said he kept writing prescriptions after the DEA told him to stop. Today, the doctor who once strolled the team’s sidelines and treated its most valuable assets — its players — is worlds away from the team. Based on a judge’s ruling, he cannot write any prescriptions and must turn over all prescription forms. He also is forced to stay in his home, where the remnants of his past — from OlympicÂ diver to his status as a prominent doctor — appear to be all he has left.